Stick to the rib goodness! 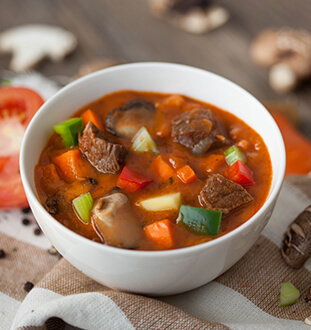 Inspired by one of Hungary’s most symbolic national dish, this hearty beef stew made only from NZ grass fed beef is loaded with a myriad of fresh vegetables and peppered with fresh herbs and spices, plus a generous dash of sweet paprika to make it a satisfying meal in itself. Beef stock (water, beef, root vegetables, herbs), marinated grass-fed beef, carrots, potatoes, whole peeled tomatoes, green bell peppers, tomato paste, celery, cream, corn flour, shiitake mushrooms, onions, red bell peppers, sour cream, vinegar, sugar, sweet paprika, garlic, salt, vegetable oil, herbs and spices.